Rugby Town Ladies finished the season off with a victory against Coventry City Development. The game started well with Rugby in control and looking the better side, passing well around the pitch. The ladies played out from the back through Adele Rogers, Jen Johnston and Caitlin Revan. Great work on the ball from Kat Watkins and Chloe Debae in the middle led to some great balls being played in the path of forwards Andie Coupland and Megan Board. 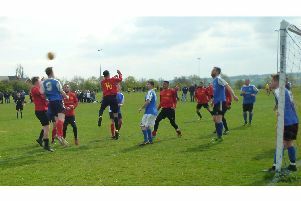 With ample opportunities and much of the play being in the final third, it was only time until Rugby started scoring. The first goal came from wingback Hannah Parker, who made an excellent run with the ball into the box. Despite defenders being in the box Hannah kept going and was rewarded. Kelly Worthington was able to link up well with Loren Bliss, who made some good runs down the left wing, putting crosses into the box. Megan Board did a good job of holding the ball up, looking for Andi Coupland who was able to receive the ball and run at the Coventry keeper. Andi was rewarded when she was able to fire home for 2-0 through a great ball over from Adele Rogers before half time. The second half saw the ladies continue controlling much of the game, attacking down the right wing through Hannah Parker and Kat Watkins. Coventry started to put more pressure on the Rugby back line, however the centre backs were quick to react keeping the Coventry attack out. Adele Rogers was able to play a great ball over for Andie Coupland to run onto. Staying strong she was able to make a great finish for 3-0. Through tiredness, the tempo started to drop but goalkeeper Leah Morris was able to keep a clean sheet. The win in the league means that Rugby Town Ladies have managed to avoid relegation from the West Midlands Regional South league, something they have been unable to do in previous promoted seasons. They are hoping to build on this for next season and are confident they can do so, having welcomed new manager Allan Board into the team. After eight seasons in charge of the ladies, Jason Morris has made the decision to retire from ladies’ football. His contribution over the years has not gone unnoticed, he has been instrumental in the growth of the ladies’ game in the town guiding the team to promotion on numerous occasions and more recently a league cup final, county cup quarter-final and promotion last season. He is very well respected amongst players past and present, having coached and enabled many players over the years to go on to play at a higher level.